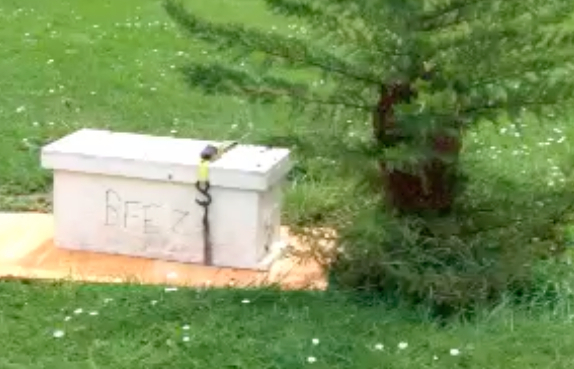 May 11, 2014…This little nuc hive survived the winter in a tree without any help from me. No sugar feeding or pollen paddies supplied. (Tough love) No honey was taken. It came from a swarm on April 18, 2013. Now it’s ready to swarm. 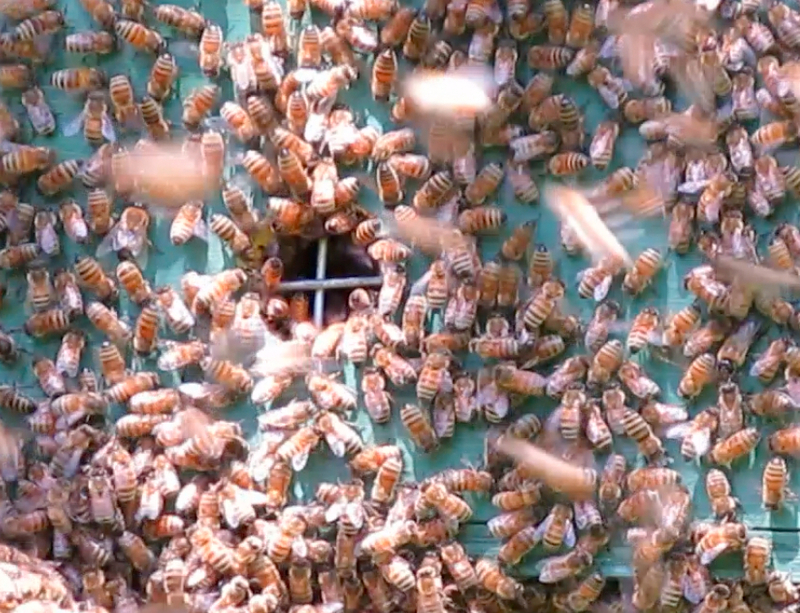 Ten minutes later, the bees appear to be headed back into the hive. Later in the day, all was quiet. 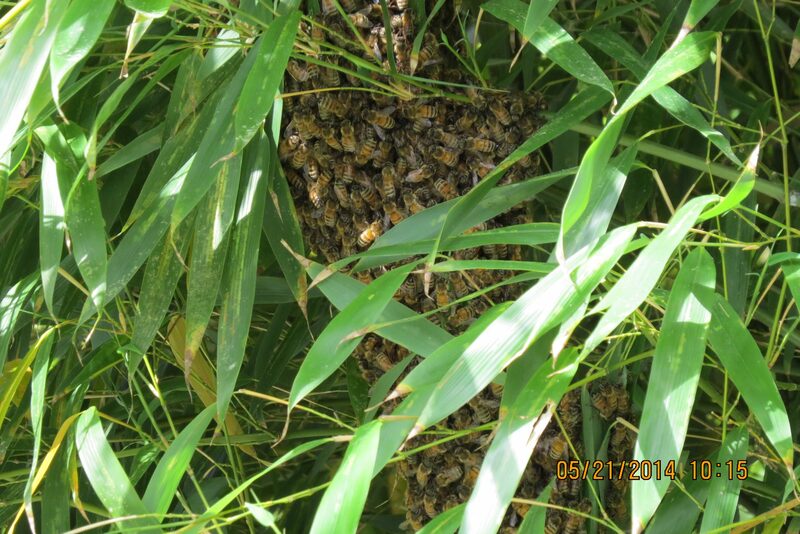 May 19, 2014 (8 days later)…A swarm starts to form in the bamboo. Could this be two swarms from the same hive? 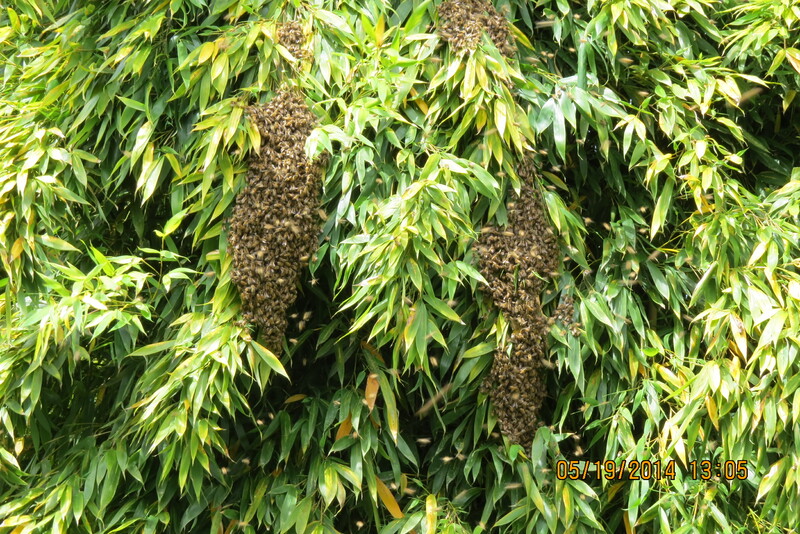 May 19, 2014…While the swarm is forming on the bamboo, bees are fanning at the entrance to the tree hive. 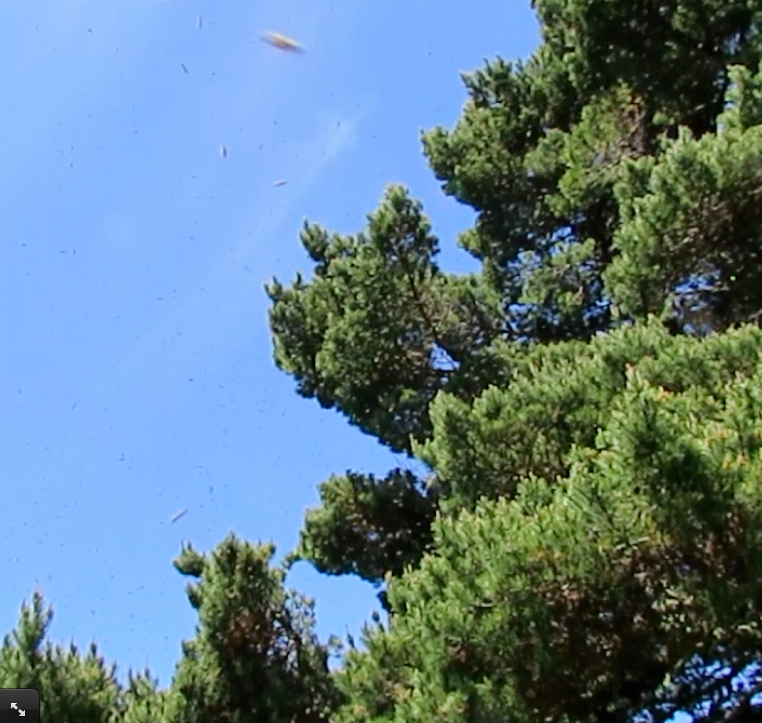 By late afternoon, all the bees returned to the tree hive. 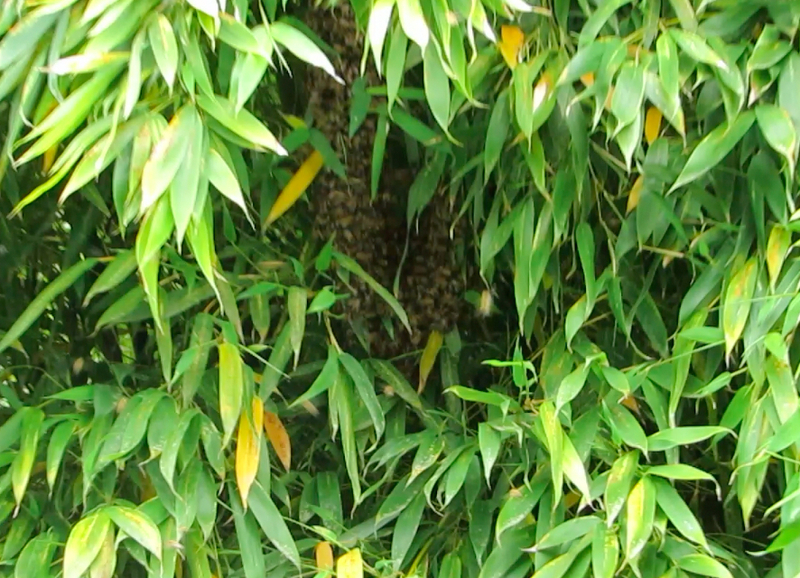 …and a small swarm in the bamboo. Again, a small group of bees are fanning at the entrance to the tree hive, while other bees are flying around the two swarms. Could it be that the queen can’t/won’t fly? It came from a swarm, so I know it’s wings haven’t been clipped. I guess I’ll find out in the next few days what is going on, but if a more experienced beekeeper wants to hazard a guess, I’d be curious. 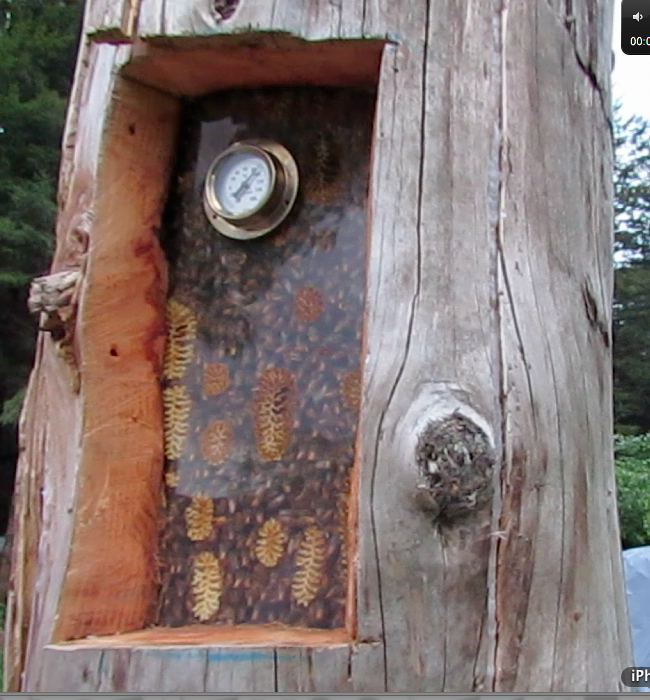 In looking back at where this swarm originated from…from my log hive, on April 18, 2013. The swarm picked this patch of bamboo to settle in. 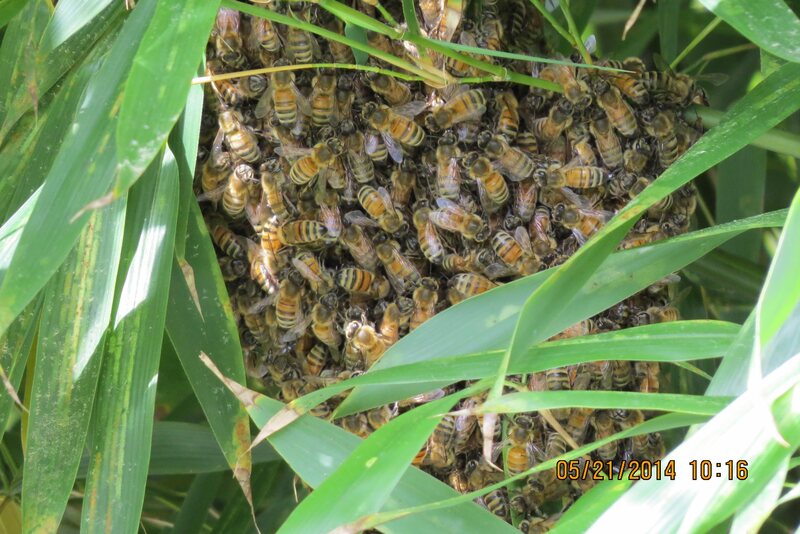 May 21…I checked to see if the swarm was still in the bamboo this morning. It was. 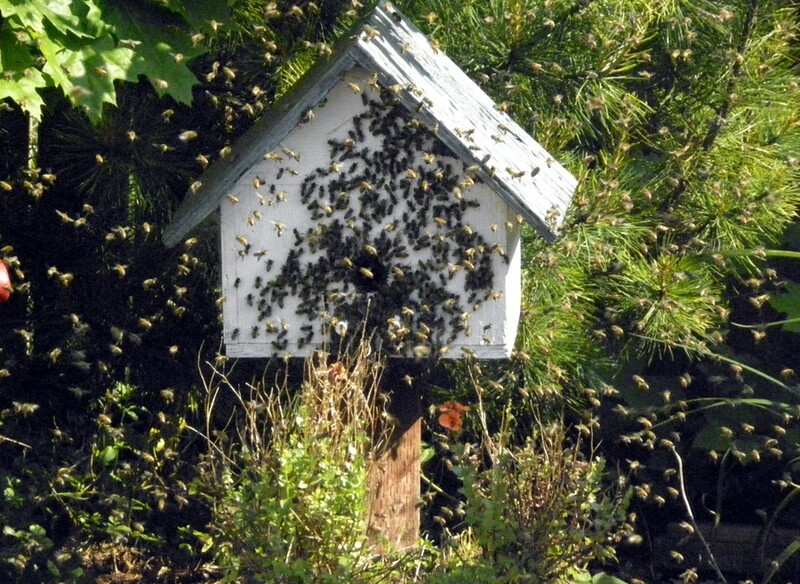 A closer look reveals that while small, this swarm might be big enough to make it. I called Bob to see if he still was interested in getting swarms for his Kenyan Top Bar Hives. He was. Bob bags his first swarm. 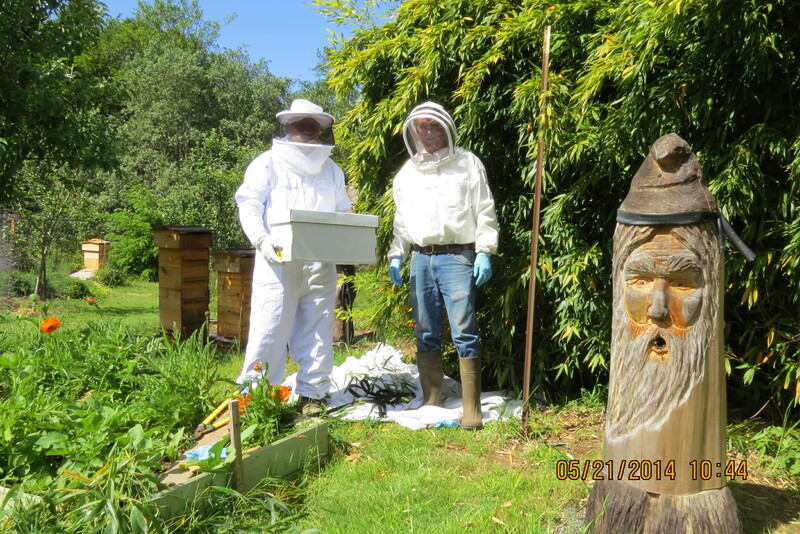 Bee Beard Log Hive looks on, as patient and quiet as ever. Bob said he was interested in getting the blackberry swarm too. It went very well. 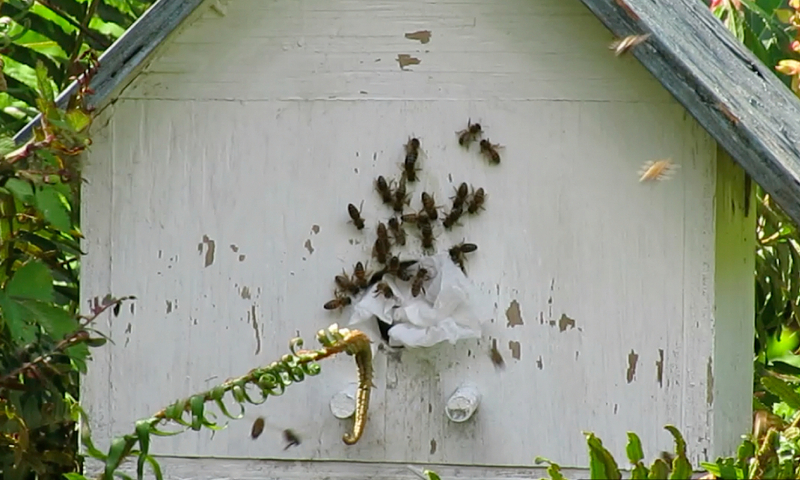 Here the bees are fanning to indicate the queen is within. Bob gets his second swarm. “Two in one day,” not bad for a new beekeeper! 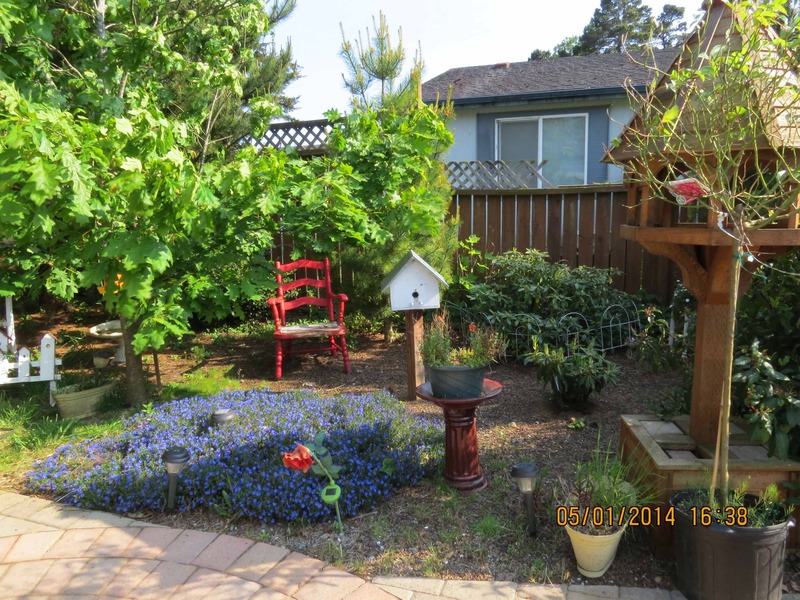 April 28, 2014…Vernon’s first Perone hive is on the left. The colony in the older hive was started from a swarm 11 months ago. Clearly it over-wintered successfully under the Perone system. 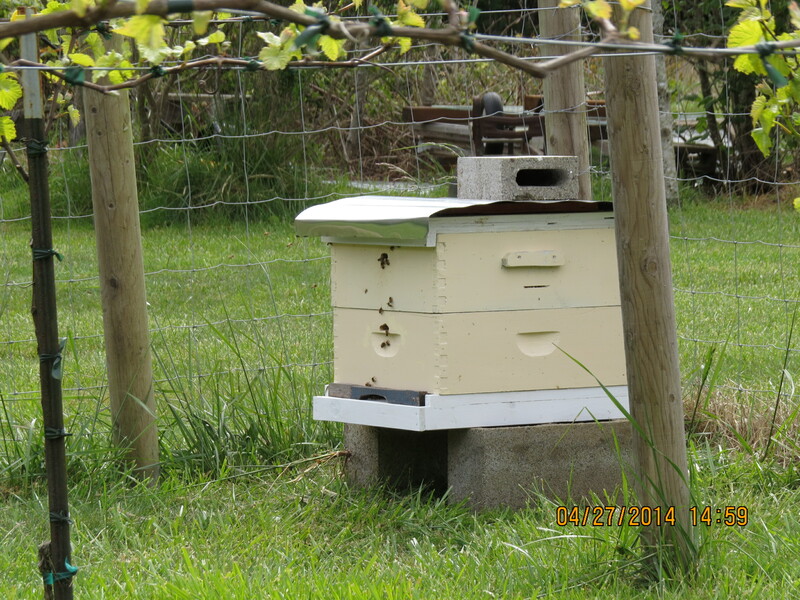 In Vernon’s words…”This winter I built a second Perone hive. This version includes 16 ½ x 11 ¼ inch observation windows in the front and back of the brood box. The windows are 1/8 inch plexiglas that my local hardware store cut to size. 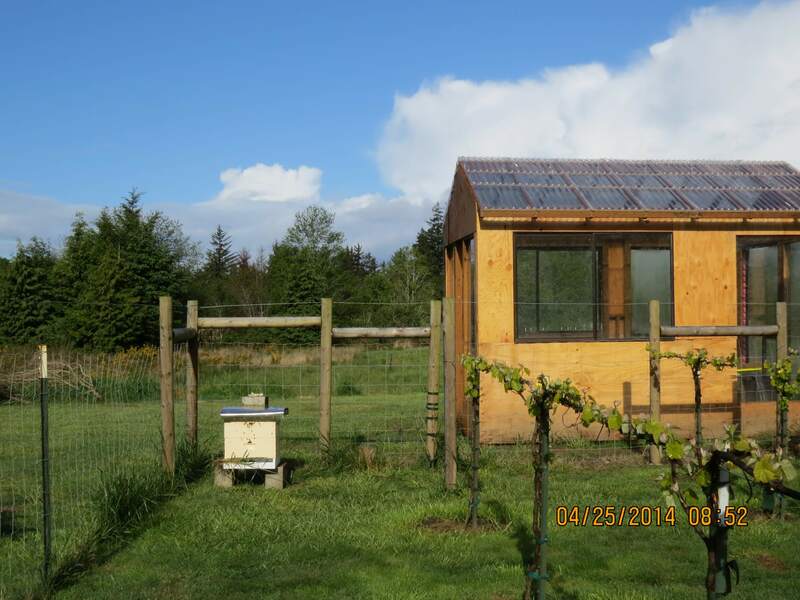 The plexiglas was so easy to work I bought two additional pieces to cover the roof and another to serve as a lid over the brood box grid bars. The roof covers were adhered to the wooden roof and sealed on all sides with beads of aquarium-safe silicone cement. The window covers were made of knotty pine. 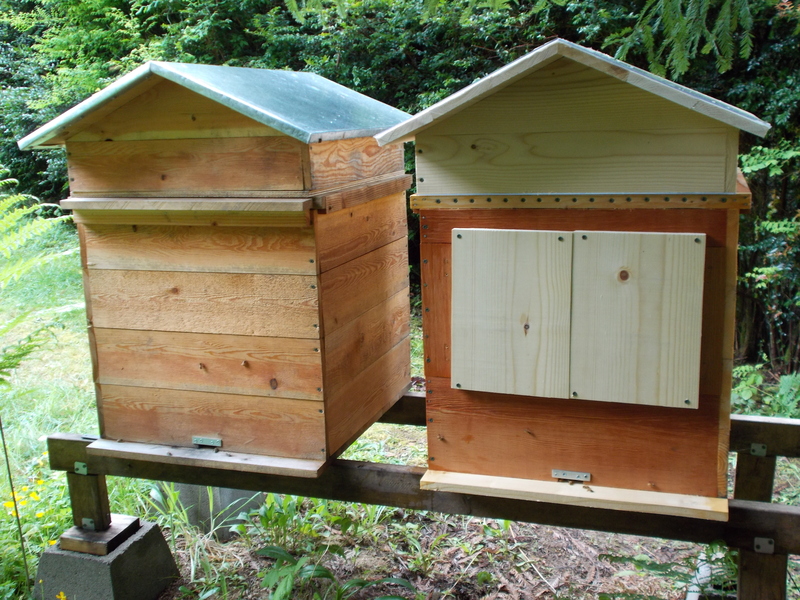 Otherwise the design of my two hives is the same. Lacking a swarm, I decided to stock the new hive with purchased bees. A 3 pound package arrived April 15. After a night in my garage, the package was placed unopened within the Perone hive brood box for 40 hours to allow the bees to acclimate. Then I opened the package, removed the queen’s cage, and suspended the queen’s cage under a centrally located top bar using masking tape. April 18, 2014…The queen in her hanging cage was immediately surrounded by a mass of attendants. The next day I let the queen out of her cage. After a few hours the queen and her attendants had moved in a mass to the north-west corner of the brood box grid, where they seemed content to settle. Hopefully I won’t use the observation windows so often that I (negatively) impact the success of the colony. The bees had been packaged with enough syrup to feed them for a week, and I’d been warned that they might need that much time to accept their new queen. However, when I opened the package the feeder was empty. Probably the syrup had leaked out. 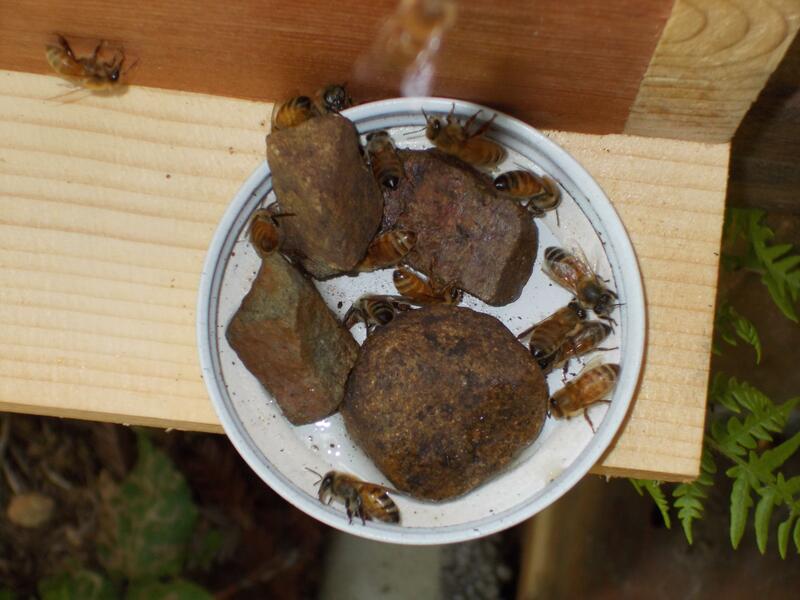 Feeling guilty that I should have released the bees from the package sooner, I made a very simple jar-lid-and-rocks syrup feeder and refilled it occasionally for four days. The bees fed from it, but not very much, and after four days I removed it. 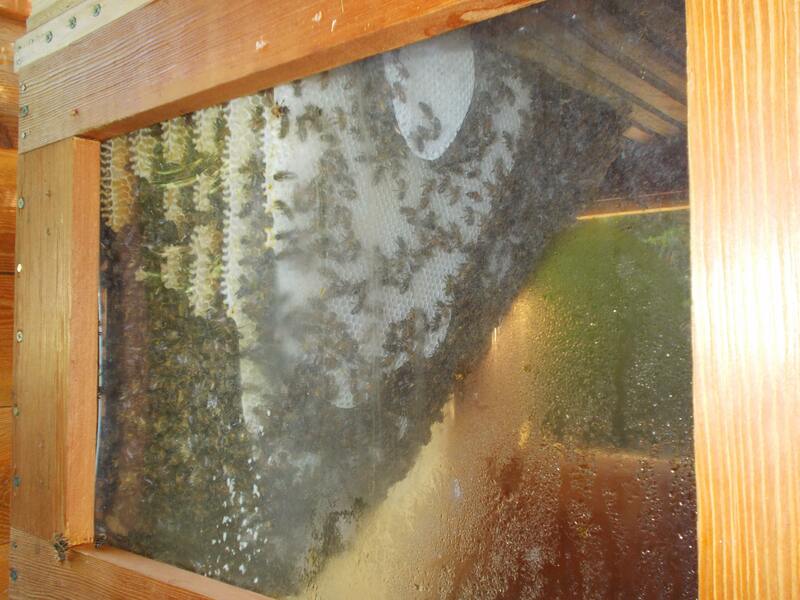 A lot of dead bees were observed inside and outside the new hive during the first six days after freeing the queen. Since then I’ve found very few dead bees and the overall foraging behavior of the colony has become more purposeful and successful. About 10% of the foragers are returning with bright yellow pollen. A week after the new bees were introduced, the two colonies display similar behaviors at their hive entryways. 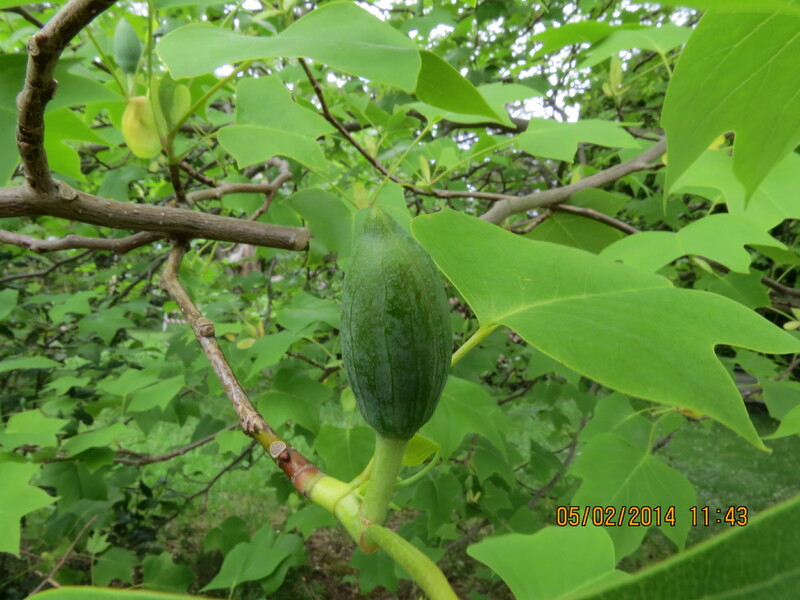 Early in June the physical appearance of the foragers should change a bit. 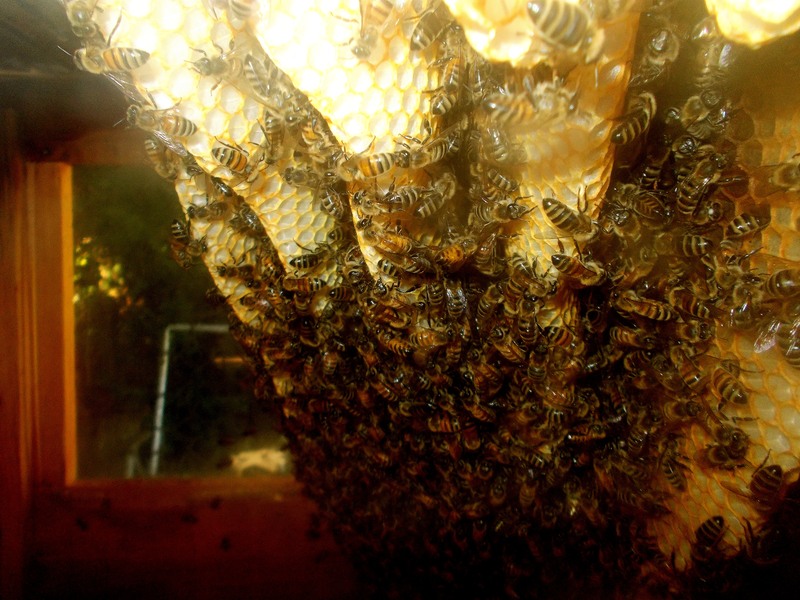 The queen of the new hive is a Carniolan variety, but the bees shipped with her in the package are all Italians. When it isn’t too cold outside I find it restful to sit on a lawn chair about two feet in front of my hives and watch the foragers come and go. It’s a form of meditation. That’s what passes for hive inspection at my apiary. The foragers never sting me. 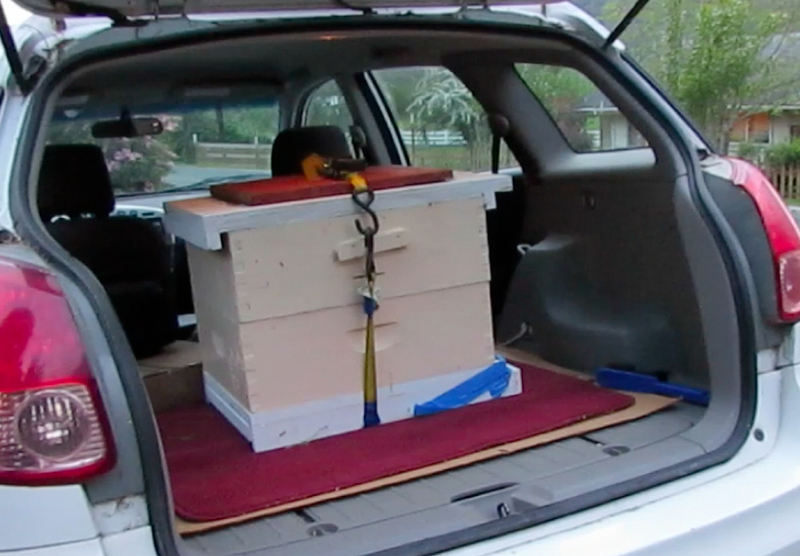 When it’s cold the bees stay inside and no inspection is possible. I’ve been told that my bees have mites because all hives in the USA have mites. Perhaps that’s true, but I’ve never observed any sign of any disease. Maybe I’m not looking hard enough. But if mites are present they don’t seem to be a threat to the survival of my colony, at least not yet. Some of my friends are trying to combat mites by keeping “hygienic” bees that are naturally vigilant in removing mites. The Russian honeybee strain is supposed to be hygienic, but I don’t know anyone who is raising them. Instead, several are going to “requeen” their hives by introducing queens from hives that are certified never to have been treated for mites. The fact that the queens are still alive without treatments makes them “hygienic.” To me this sounds like circular logic. An equally valid conclusion is that mite treatments reduce the capacity of a colony to fight infestation through normal comb maintenance. In other words, all bees are hygienic until poisoned. 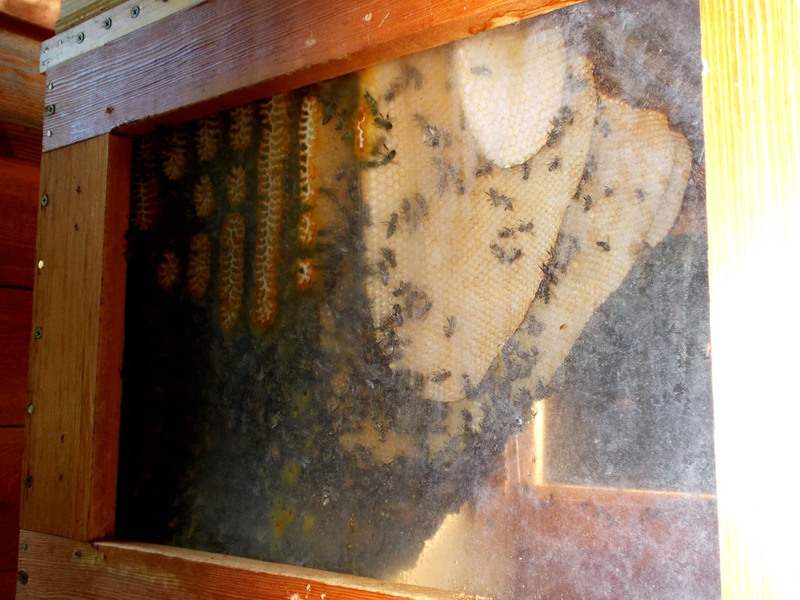 Going into Winter, the comb occupied only a small fraction of the big Perone hive. It’s likely that the over-Winter population was quite small. Now the colony is a year old and business is booming at the entryway. 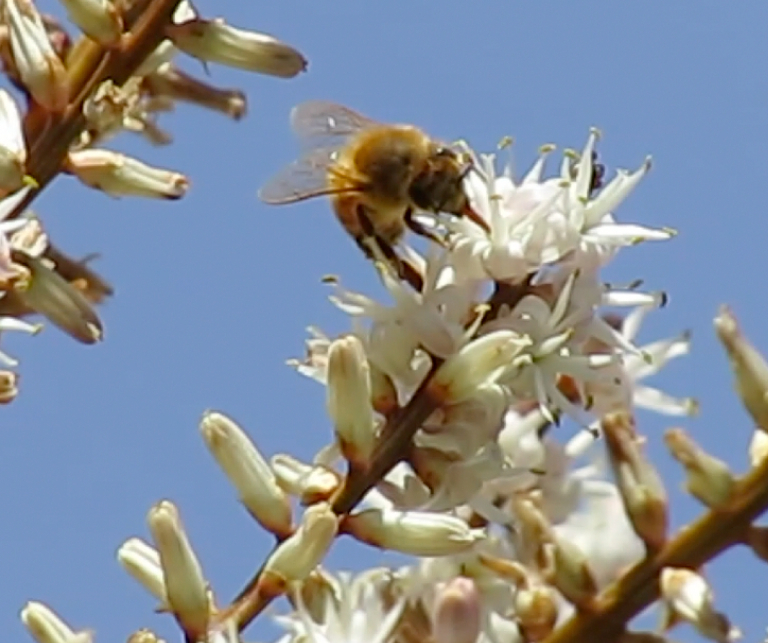 The yellow pollen is almost certainly myrtle and the bees have been collecting it for months. The orange pollen is of unknown origin and sticky. 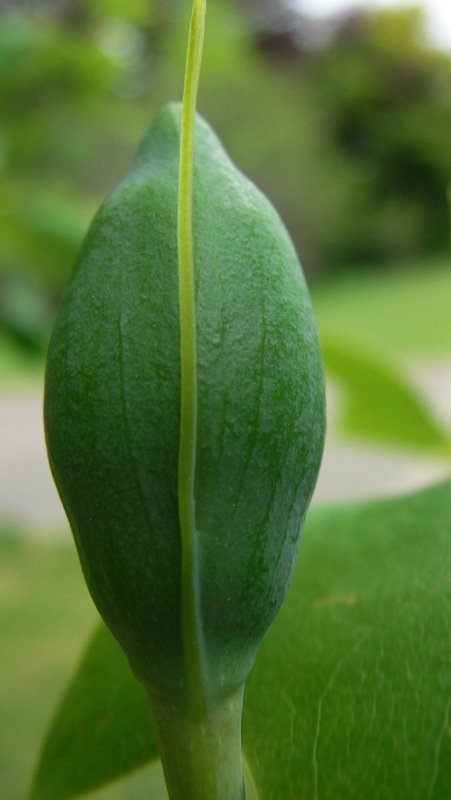 Some foragers are returning smeared with it. 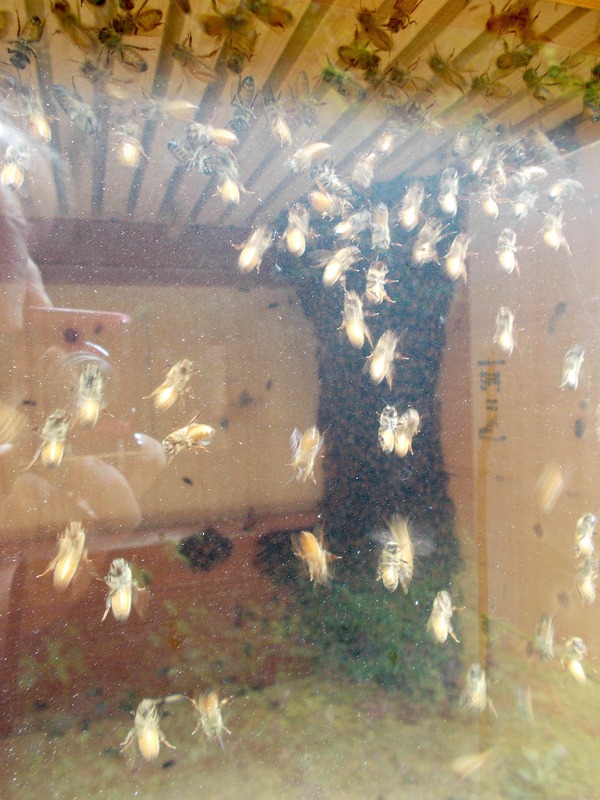 May 25, 2014 Vernon’s entry…”There’s been a population explosion in the year-old hive. During the warm hours the small entryway seems hardly adequate. To relieve congestion the bees have developed a traffic pattern with exit on the right and entry on the left. The system breaks down a lot but I’m still impressed. I keep a couple of supers stored away. One of them has an entry, and stacking it on would give the old hive bees two doors. 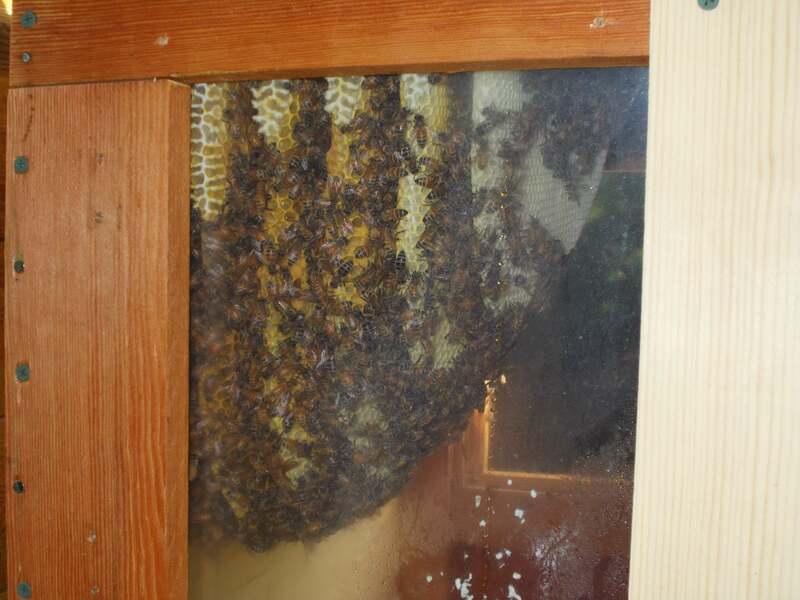 This morning I decided to take off the roof and look down through the bars to see if the hive is ready for the super. A clear plexiglas lid over the bars allows me to look inside the brood box without opening the hive and disturbing the bees too much. The bars are oriented north-south, and the eastern 3/4 of the hive looks full. Four or five bars on the western side aren’t being used yet. The brood box still has room, so I didn’t add the super. May 27, 2014 Vernon’s writes…“Okay, I put the super on the year-old Perone hive. With decent honey now selling for $6/lb and up I’m counting on the girls to keep me well-stocked. The 1/8 inch thick plexiglas lid was warped pretty badly and was letting in some water droplets. I replaced it with an indoor plywood lid over the super bars. Later I’ll replace the plexi lid on the new hive as well. Actually, the thin, construction-grade boards of the hive body are also warping in some places. If spaces open up I’ll probably seal them with fine mud. Maybe I’ll give the hive a fresh coat of linseed oil. 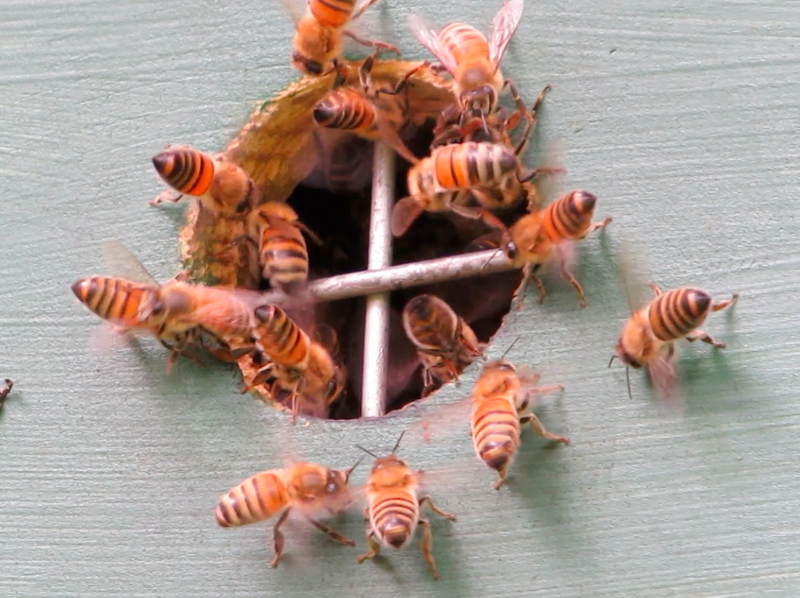 For the last three days foragers from both of my colonies have been bringing back much less pollen. With all the blackberries and assorted wildflowers in bloom nectar should still be plentiful. A large number of drones were observed entering and leaving my older hive, more than ever before, but still no signs of swarming. Moisture droplets coated both observation windows, making photography difficult. Humidity in the hive must be quite high. The new colony is building comb from the northeast corner of the hive out. There are seven combs so far, suspended from the first seven bars numbered from the east wall. The space under the first bar was a solid mass of bees so I couldn’t actually see the comb. The combs are as ruler-straight and parallel as any I’ve seen. 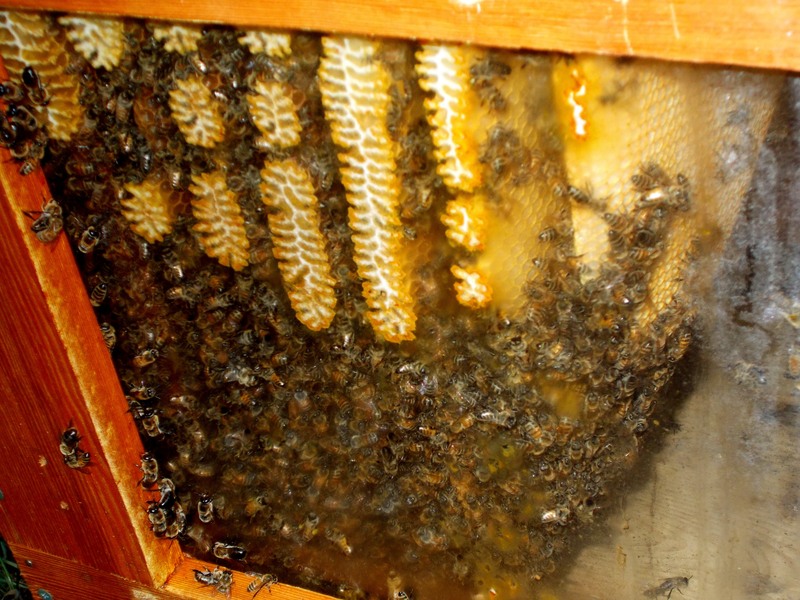 My other Perone colony disregards the top bar orientation and builds highly-irregular comb. The maximum depth of the comb is 28 cm (a little over 11 in.). 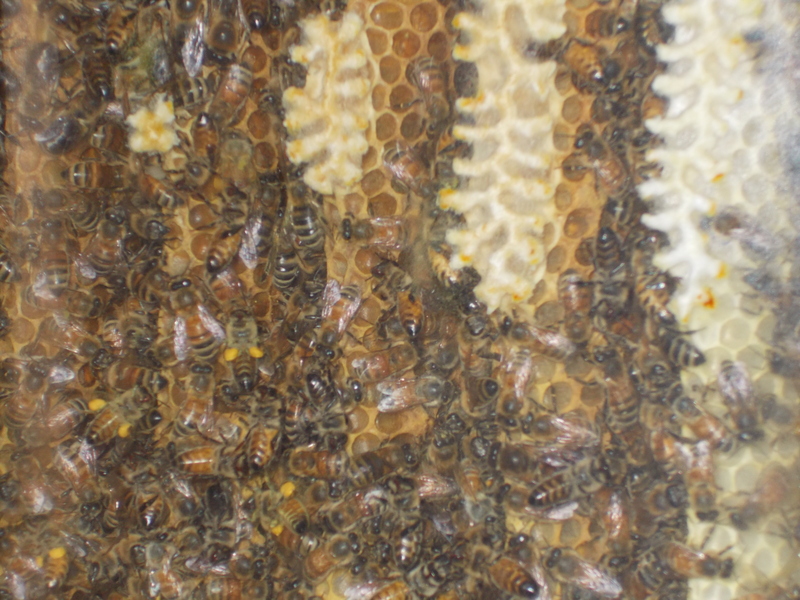 This close-up shows the comb attendants are a mix of Italian and Carniolan varieties (Carniolans have darker abdomens). The package used to start the colony was comprised of Italian workers and a Carniolan queen, meaning that all the Carniolan workers in this photo were born in this hive. The package was shipped to me on April 15, so all the Italian bees shown are at least 47 days old. 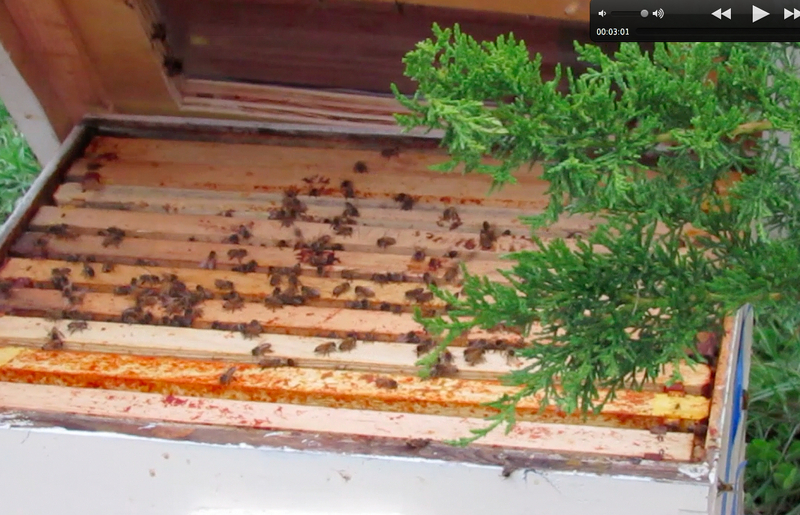 July 1, 2014…The traffic at the entries of both of my hives seems slightly down from a late May/early June peak. Worried that my hives might be infected or invaded or something, I took the shutters off the new hive for a “10th week check-up.” Everything looked fine inside. Comb building is continuing at a fast clip. There are now eight combs, the largest of them just under 18 inches deep and 19 inches long. 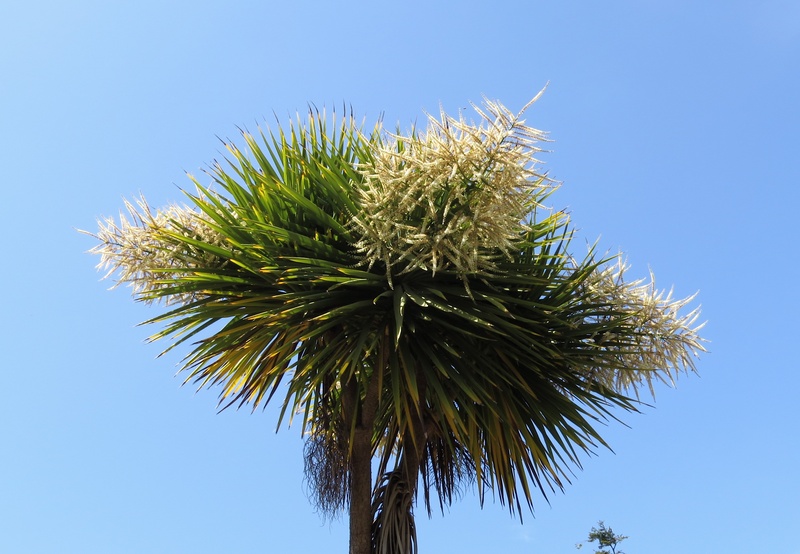 July 1, 2014… A cute little ninth comb is just getting started. Water droplets on the window indicate high humidity, which concerns me, though the bees seem okay with it. 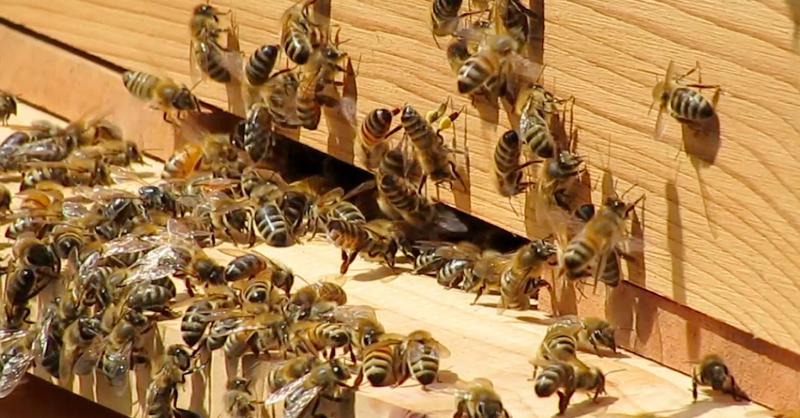 July 4, 2014…Some honey-filled cells are visible in this close-up. 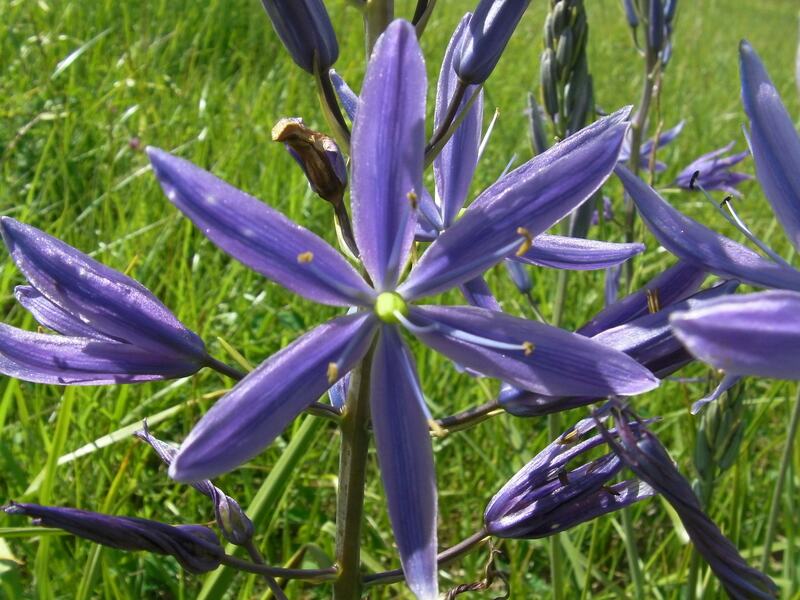 The queen of this colony is Carniolan, but the workers seem to include a number of Carniolan/Italian hybrids. 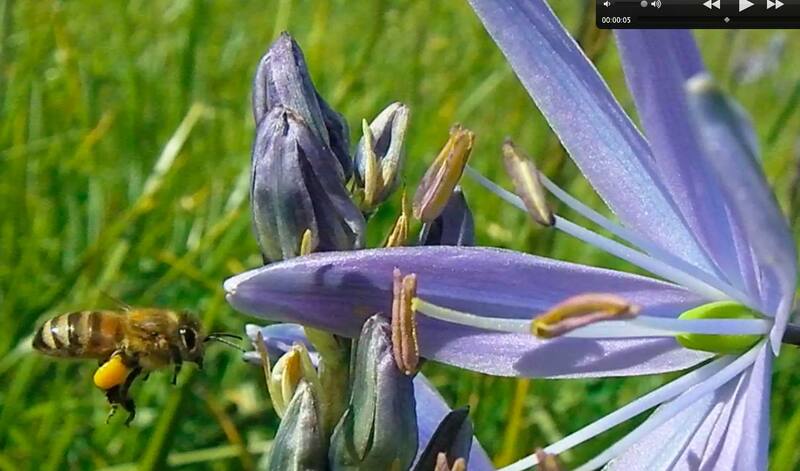 July 4, 2014 – Vernon added…Over 50% of my foragers are bringing back pollen today. That’s a new high. Most of the pollen is yellow, maybe sow thistle, which is growing anywhere in Klamath that isn’t being mowed. That includes my lawn, which I haven’t mowed in months because it’s full of wildflowers and the bees are all over them. Sweat bees and a little black thing (probably a fly) seem to prefer sow thistle, bumble bees like the purple clover, and honey bees go first to blackberries and white clover. 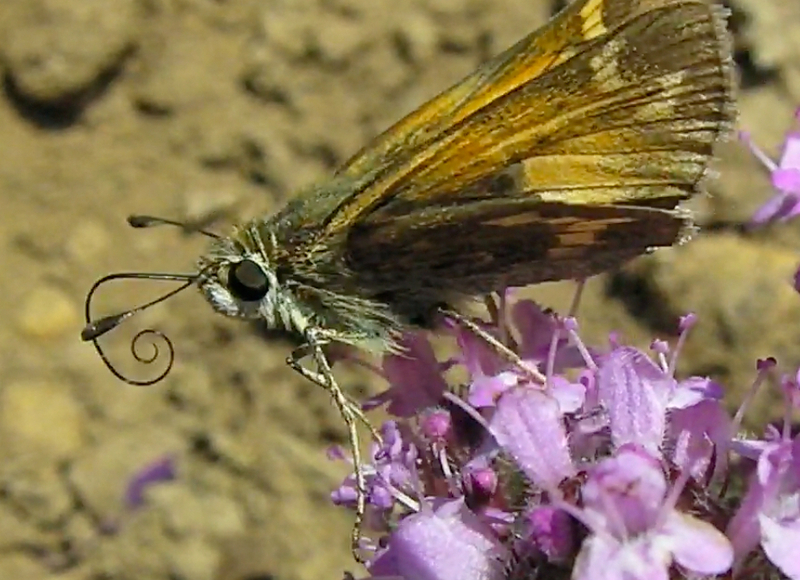 There’s also a low-growing purple flowered weed that attracts all the pollinators. 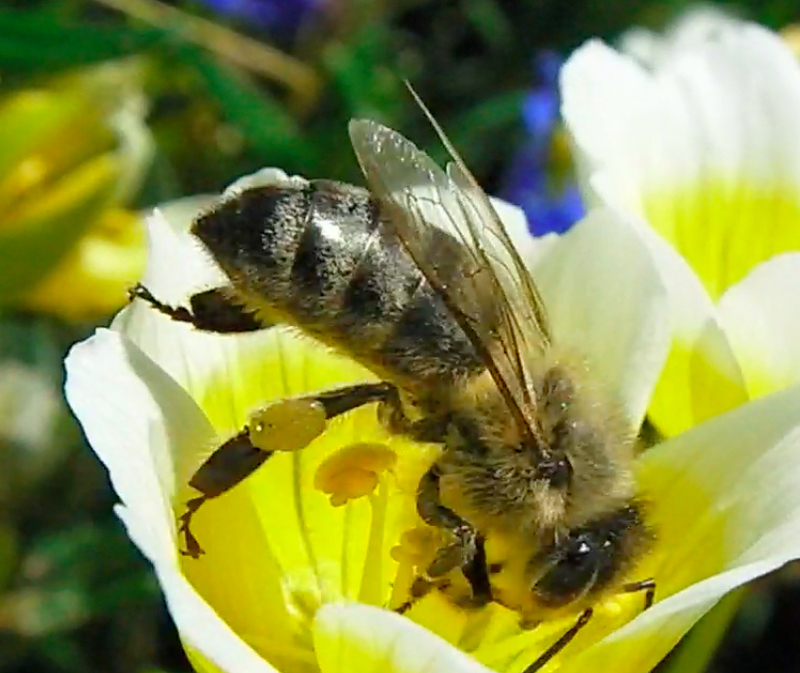 I like the idea of providing for the bees passively, by not mowing, rather than actively planting flowers the bees might like. Of course, if I lived in suburbia with neighbors who could see my house I’d probably be getting complaints about my ratty-looking yard. 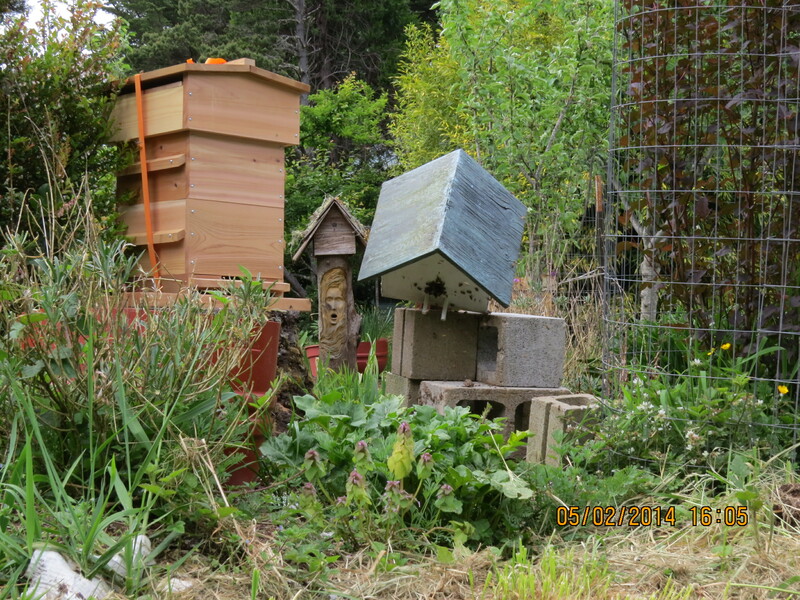 August 1, 2014 – After much waffling I’ve decided to over-winter my older hive with the super in place. 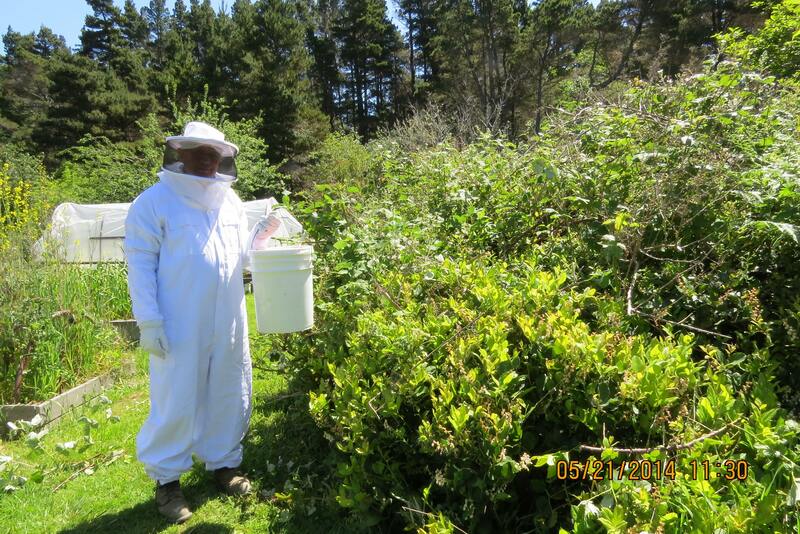 My first honey harvest will be next Spring, when the colony is about 24 months old. That’s in keeping with Perone’s recommendation that the first harvest should come at 18 months or more. 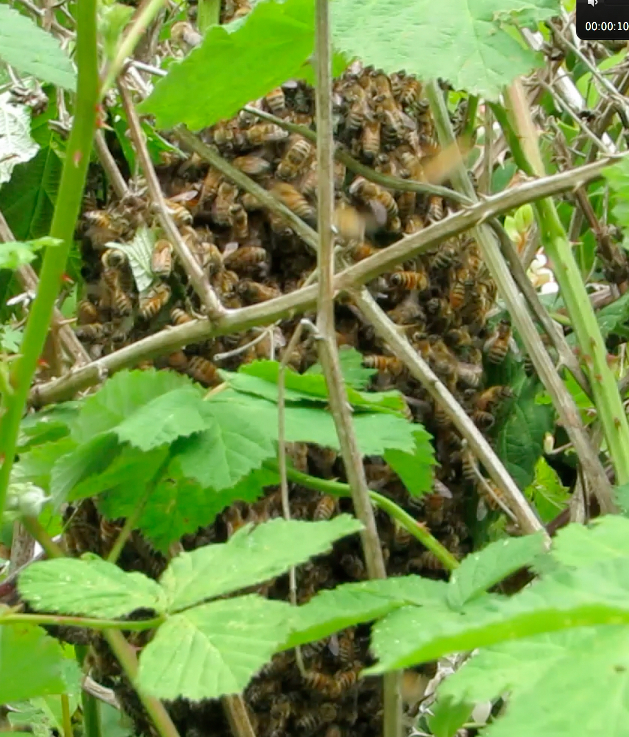 Since adding the super May 27 the major nectar flows have been blackberry, clover and thistle. Bees make exceptional honey from all these sources, so it’s hard to resist putting it into bottles. But I’m just not confident the hive has enough stores in the brood box alone to last the winter. The foragers have brought back very little pollen this week. Most of the wildflowers in my unmown lawn are shriveling away. There are still some thistle, and plentiful Queen Anne’s lace. My bees don’t seem to like Queen Anne’s lace much, but they are visiting them occasionally, probably because other flowers are getting scarce. Bumble bees have elbowed the other pollinators away from the few patches of red clover that remain. The only pollinators I’ve seen on my pretty-but-intrusive orange freesia weeds are hummingbirds. 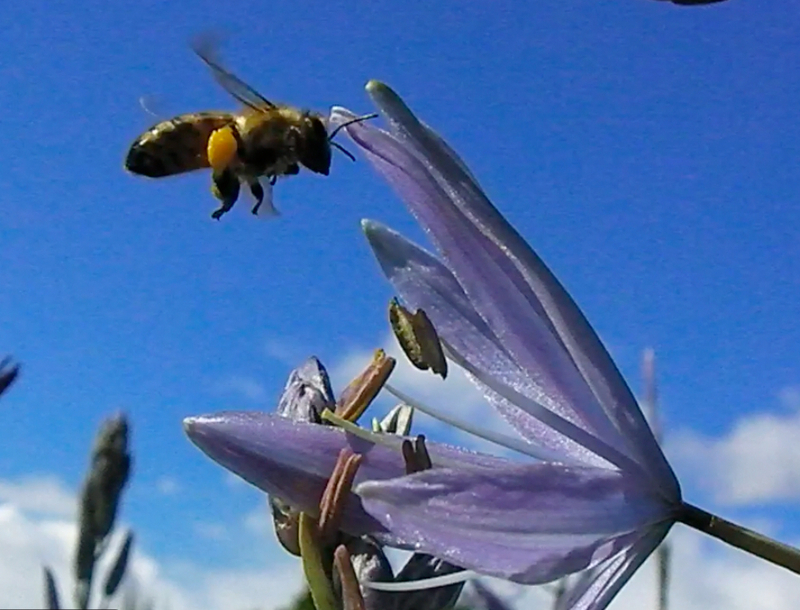 Some of my beekeeper friends maintain that the nectar flow is virtually over in my area. They are feeding syrup now. Certainly the number of foragers from my older hive is decreasing, but the new hive is sending out more foragers than ever. I’m trying to learn how to assess nectar collection by comparing the relative abdomen circumferences of the bees entering and leaving the hive. 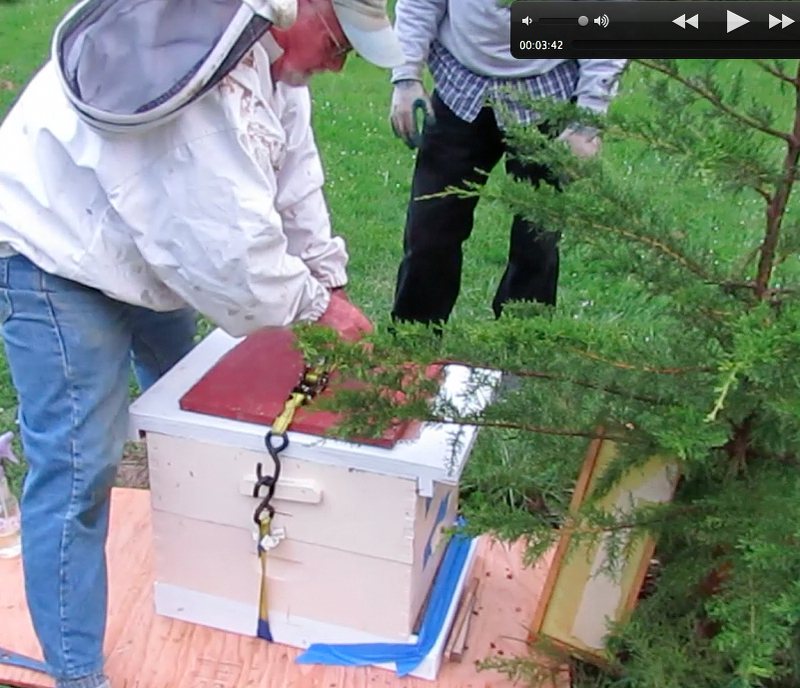 On August 1 the shutters came off my newer hive for a quick assessment. 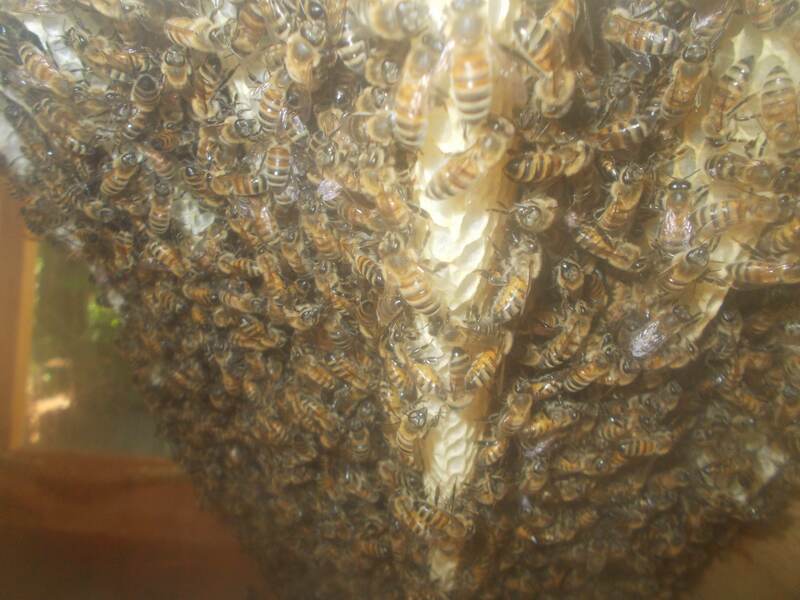 Comb building continues and the colony has no observable disease. 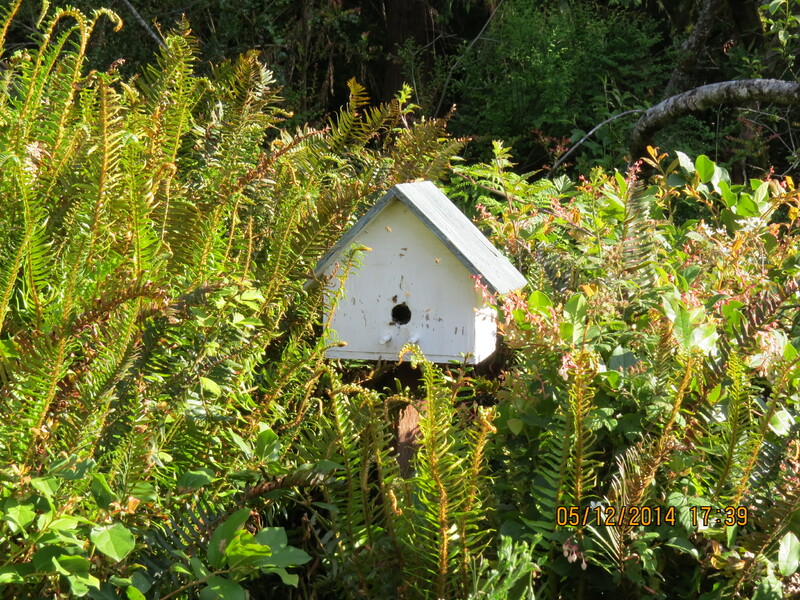 The population is quite high for a first-year colony (though several times lower than that of the older hive). 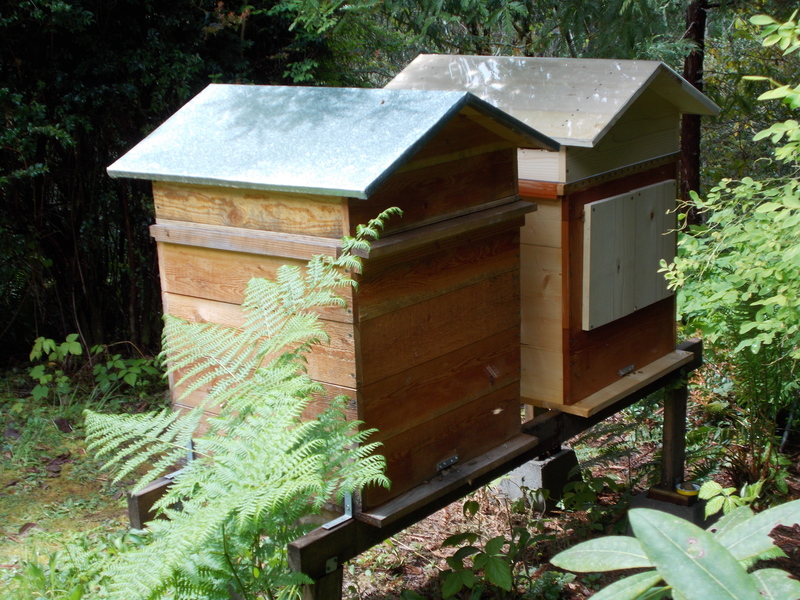 The fixed-bar design of the Perone hive doesn’t permit direct observation of honey and pollen stores. However, foraging remains vigorous and comb area is more than sufficient, leading me to conclude that the colony is probably setting up well for the Winter. 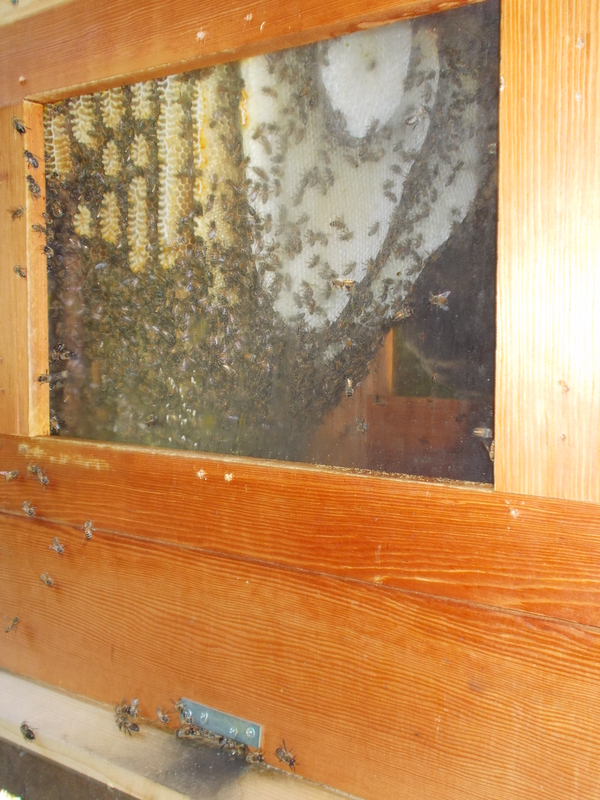 Nine functional combs are now adhered to the north wall of the hive, and a tenth “baby comb” is underway. 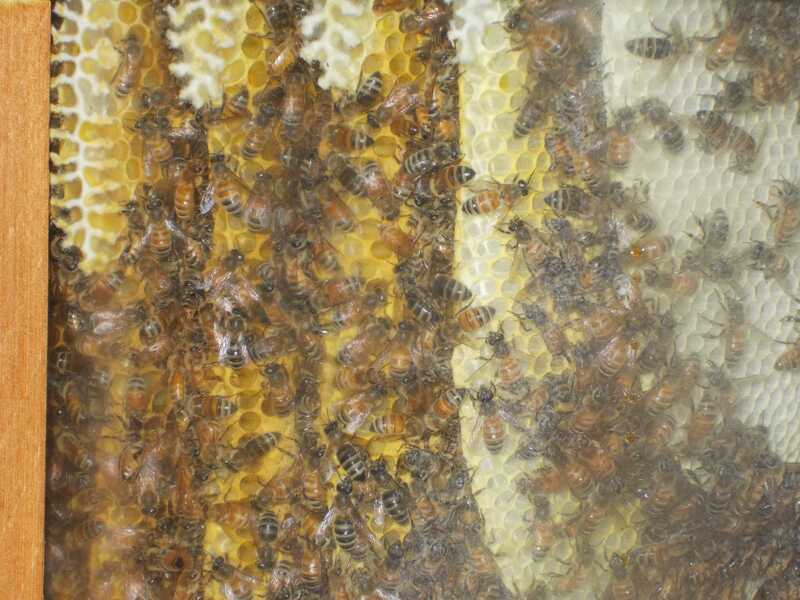 The largest combs have grown to 18.5 inches deep and 22 inches across, only an inch away from spanning the hive interior. 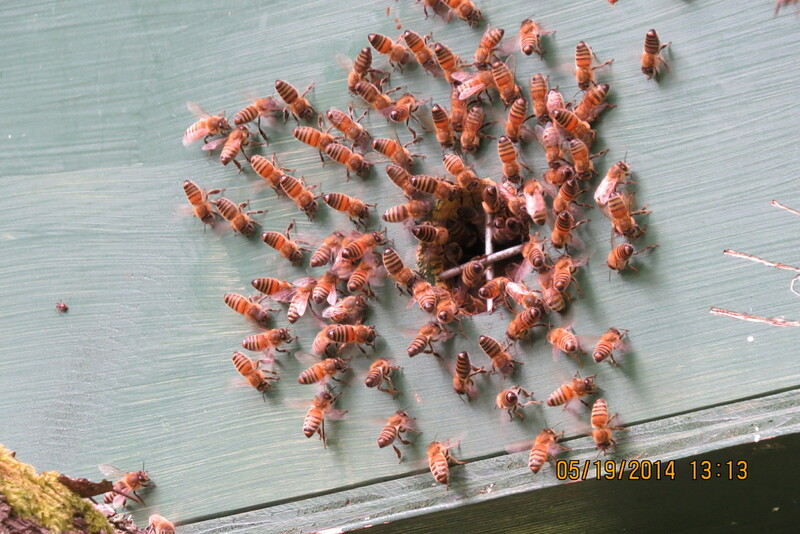 Second Perone hive, August 1, 2014…It was easy to shoot this close-up through the south window because the combs are almost touching it. Does anyone see signs of disease? To me this looks like a big thriving colony of Carniolans doing what bees do best. 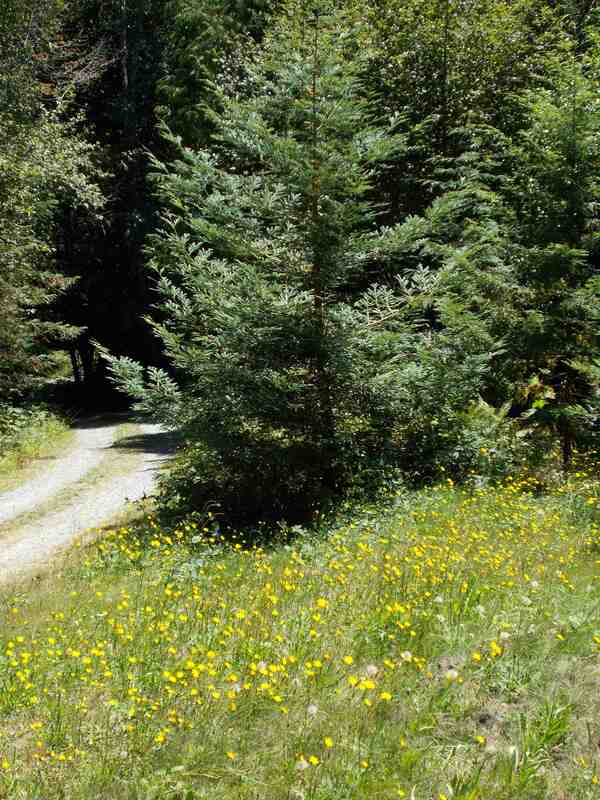 August 1, 2014…Only 12 days ago the driveway leading to my house was lined with thistle flowers. Most have gone to seed now. It’s been a dry year in California and my place is parched. The forager numbers are down for both of my hives, especially the older one. I doubt there is much nectar available to them. 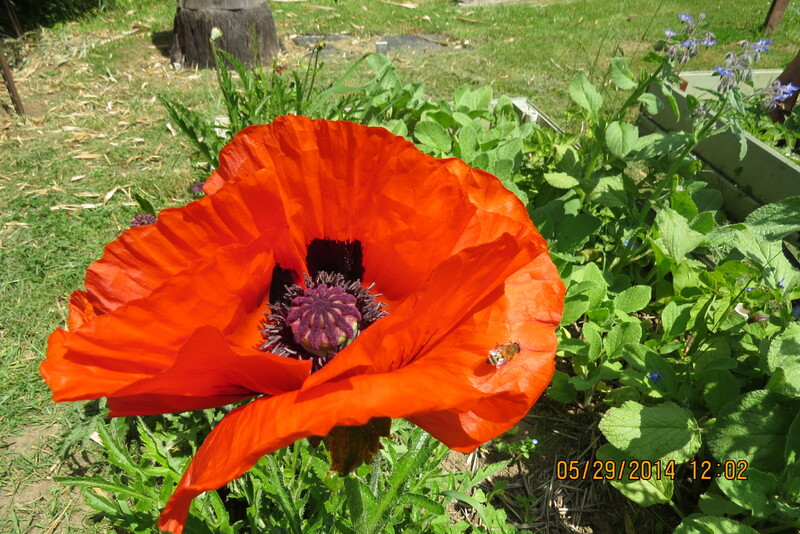 Last week the foragers brought back a lot of orange pollen and smaller amounts of other types. From a lot of observations I was able to confirm that the orange pollen comes from sow thistle. The newer hive produced a lot of drones this year and the workers are currently doing their best to expel those that remain. 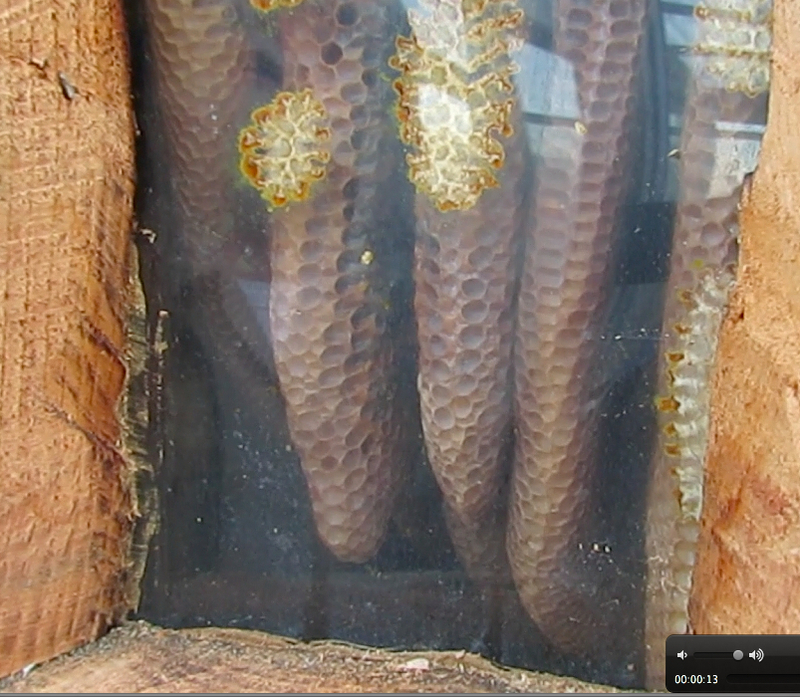 A quick check inside the hive shows no measurable comb building occurred during August. The colony population also appears unchanged. This view from the other window shows a lot of empty cells. Building additional comb now would probably be wasted effort. Carnies are noted for their early winter preparations, and everyone seems quite busy. October 2, 2014…Comb building has stopped but the worker population remains steady. 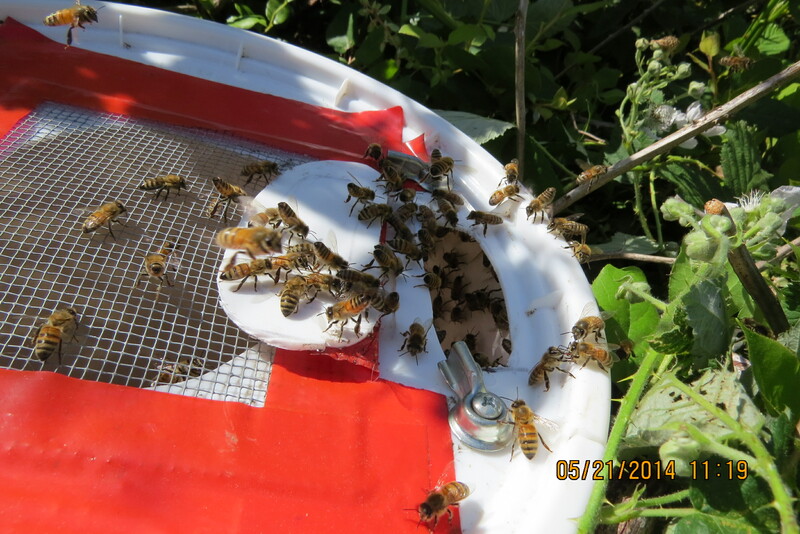 October 7, 2014…Yesterday and today the foragers from both my hives have been out in big numbers, and they’ve been bringing back a lot of pollen, mostly orange pollen from sow thistle. 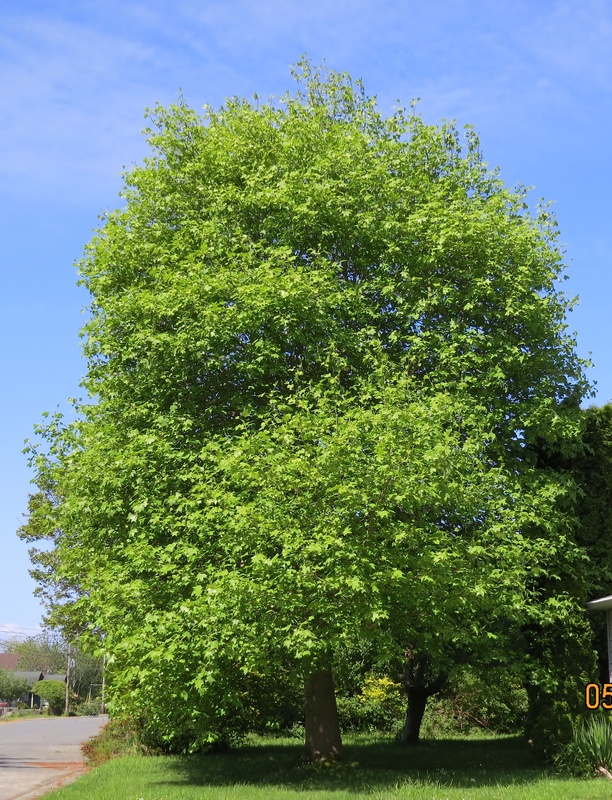 When I checked the on-line weather report it said there was very little pollen from trees and none from grass and flowers in my area. So I know not to rely on pollen reports anymore. These little rains we’ve had have put the pollinators back to work. October 19, 2014…My bees have been foraging in large numbers all week, bringing back lots of yellow pollen with an orange tinge. I’m seeing ivy flowers all over my neighborhood, and that’s probably the pollen source. 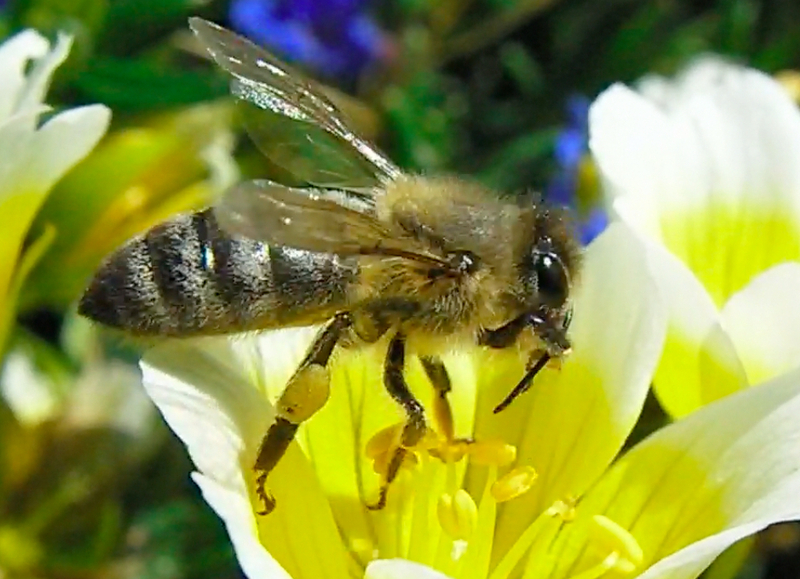 An on-line article The honey and the ivy: Why gardeners’ foe is the bees’ friend says 80% of the foragers on ivy bring back nectar rather than pollen, meaning that virtually all my bees are probably on the ivy now. After the big storm…The runways of both hives were wet. 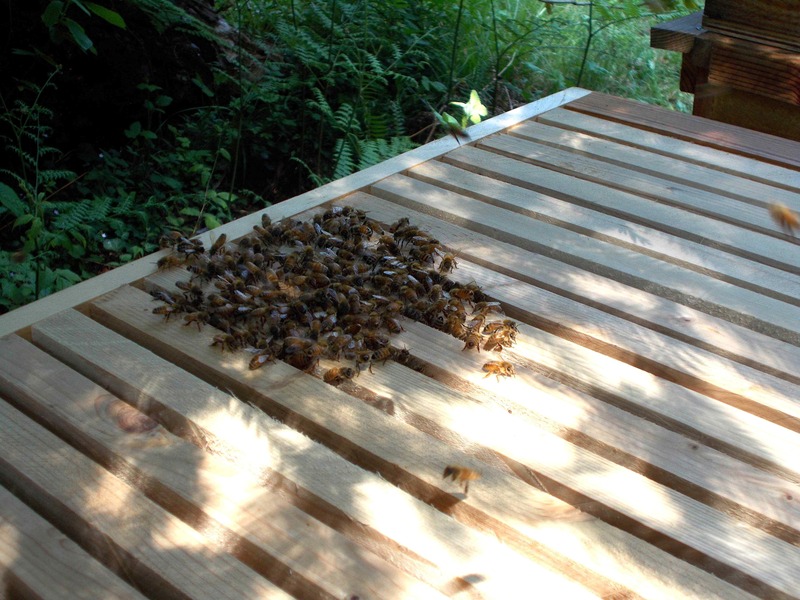 There were 13 waterlogged corpses on the new hive runway, which I removed to get them out of the way. The older hive had only one runway casualty. Foragers were out in modest numbers but they weren’t bringing back pollen. In the 10 minutes or so I was watching one worker was expelled from each hive, a behavior I haven’t seen in months. I fought off the urge to take off the shutters and take a look inside.